Florida Republican Sen. Marco Rubio proposes changing the capital gains tax as a way to discourage corporate buybacks, a position that could spook the stock market if other prominent Republicans get behind the idea. The capital gains tax is a new twist on the assault on corporate buybacks, which had been mainly under fire by just Democrats until now. Senate Minority Leader Chuck Schumer of New York and independent Sen. Bernie Sanders of Vermont have proposed legislation that would force companies to raise wages and provide more worker benefits as a condition on buybacks. Some legislators have been bristling that the GOP tax overhaul encouraged companies to buy stock instead of investing in plants and equipment, or workers. The tax plan cut the corporate rate to 21 percent from 35 percent and included incentives to spur capital spending, but critics say it has fallen short. Rubio’s plan would eliminate the preferential tax treatment of capital gains on buybacks as a way to discourage companies from engaging in that behavior. Rubio heads the Small Business Committee, which released a report on the issue that argues equal rates would remove companies’ incentives to buy back stock in the first place. Instead, Rubio wants to tax buybacks as if they were dividends, which are subject to a wide range of rates. “Tax policy changes to end this preference might, on their own, increase investment by shifting shareholder appetite for capital return,” the report says. Instead, it suggests using the revenue from a higher capital gains tax to encourage capital investment. The current tax law — passed by Republicans in 2017 with Rubio’s reluctant support — allows businesses to fully and immediately deduct their expenses, but that provision phases out after 2022. Paulsen said altering capital gains changes the whole decision making process for investors and companies. Limiting buybacks is more intrusive than some government oversight that impacted the stock market, like accounting regulations or the uptick rule that permitted short selling a stock only on an uptick. President Donald Trump has championed his economic achievements and the stock market’s performance since his election. But buybacks, an engine of the stock markets gains, risk becoming a victim of the backlash during the upcoming presidential election season, even if companies just reduce them to stay out of the line of fire. The S&P 500, even with its recent correction, is up 28 percent since the November 2016 presidential election. Brian Reynolds, asset class strategist at Canaccord Genuity, said the proposal to curb buybacks is simply the latest volley in a war on wealth that will continue during the election, and the stock market and buybacks are just the latest target. “I would say it’s the beginning of the more public phase against the stock market. The stock market has has been under attack since Dodd Frank 10 years ago and since the push back against Worldcom and Enron. I would view this as another escalation in the war against the stock market,” he said. Dan Clifton, head of policy research at Strategas, disagrees, and says Rubio entering the debate may be a contrarian sign. “It is significant that a Republican who once proposed reducing the capital gains tax is now saying we need to increase the capital gains tax. It will embolden Democrats to continue to push this fight. My sense is this is a contrarian indicator and that we are at the end of this war on wealth and that wages for working Americans are finally going up,” Clifton said. Clifton also said the criticism that companies are buying stock and not investing is misguided and the amount they invest will likely change, once Trump strikes a trade deal with China and removes uncertainty. “The premise is just wrong. 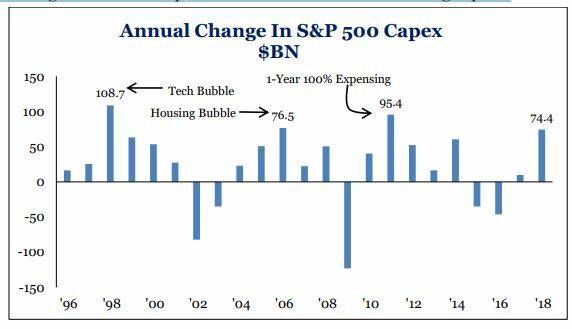 2018 had the fourth largest increase in capex in U.S. history despite a trade war. The idea that companies are not making investments is ludicrous,” he said. 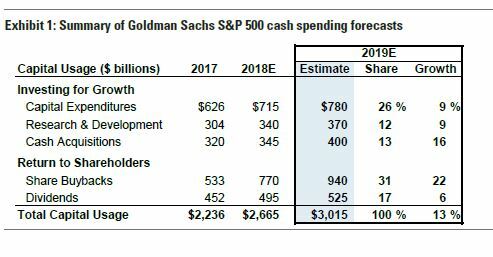 He said companies were not using funds they would have used for capex, and instead were using the cash hordes they had kept overseas until the tax law change. “The money came from repatriation. It was a one-time boost that was leading to this increase in share repurchases. They have have no understanding of what’s driving the dynamics of a bill they voted for,” he said. Reynolds said banning buybacks would surely backfire, and companies may instead be encouraged to do total buybacks of their stock and take themselves private. He said legislation is unlikely to be passed with a Republican Senate and Trump in office, so it would be at least two years before it has a chance of becoming law. Tom Block, Washington strategist at Fundstrat, however, said Trump could fall behind an idea if he thought it was expedient. “Donald Trump can turn on a dime and can be against the stock market as easily as he was for the stock market,” he said. But he too said the plan to limit buybacks would backfire. Rubio’s staff explained that under the plan, any money spent by companies on buybacks would be considered, for tax purposes, a divided paid to shareholders — even if investors did not actually sell their stock. Every shareholder would receive an imputed portion of the funds equivalent to the percentage of company stock they own. The plan is expected to result in fewer companies pursuing buybacks. But if they do, the proposal could raise revenue by both broadening the base by increasing the funds that can be taxed, and it could result in higher rates if shareholders are subject to ordinary dividend rates.